Sometimes, one just has to collect that is most awesome. 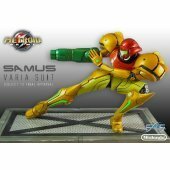 And believe me when I say that a statue of Samus, the star of the game series Metroid, is not far down on my list of favorite characters. This particular piece is a limited edition that stands 17 cm without the base and is hand cast and hand painted. There are only 2500 world wide so get yours before they’re gone. Runs for about eighty dollars USD. And it is officially licensed by Nintendo.